The achievements of anarchist ‘self-management’ during the Spanish Civil War show that production can be organised without the bourgeoisie or Leninist parties. But any genuinely anti-capitalist revolution in the 21st century will not be about democratic self-management of capitalist industry. Rather, it will be about the transformation of society world-wide so people can collectively fulfill their needs without any external discipline. Consequently, we need to understand workers’ resistance to work during the Spanish revolution rather than to just praise the achievements of anarchist militants (especially when those ‘achievements’ even included the setting up of labour camps!). The Confederación considered the Catalan regional government’s decree establishing a forty-hour week "ruinous, suicidal, and counterrevolutionary"; the reduction of work hours and increase of wages amounted to a "serious mistake." The workers’ refusal to participate enthusiastically in workers’ control demonstrated that their class consciousness differed from that of their new industrial managers. For the union militants, class consciousness meant active participation in the building of socialism or libertarian communism; many workers expressed their class consciousness by avoiding the space, time, and demands of wage labor. The militants used coercion to force the workers to work harder both to win the war and to build the new society. The war merely reinforced, but did not create, the need for coercive methods. The war was thus not the cause of the coercion and repression of the rank and file but, like the militants’ vision of the future, the result of a long historical process with prewar roots. 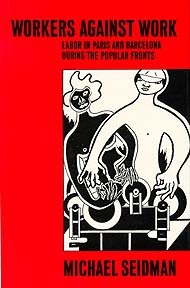 The full book and other Michael Seidman articles are at http://libcom.org/tags/michael-seidman, as is Gilles Dauve's thought-provoking When Insurrections Die. So is this a review? By who?